This summer, join us to preserve history as an Oral History Student Intern. Engage in a an enlightening and wholesome experience that will also challenge you. This is a paid internship program open to all college students. Click here to find more information and apply! Watch interviews via Stanford Digital Repository: Follow this link to view a sampling of oral histories housed at the Stanford University Library's Digital Repository. 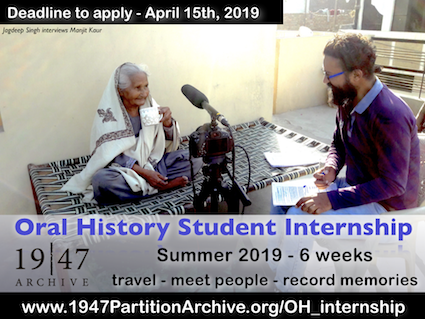 Preserving memories of Partition via CROWDSOURSING: The 1947 Partition Archive, "The Archive" has been preserving oral histories of Partition witnesses since 2010 through a combined program that includes an innovative technique for crowdsourcing by Citizen Historians, as well as collection by trained scholars. Over 7500 oral histories have been preserved on digital video, making The Archive the largest documentation effort focused on Partition. Oral histories have been recorded from 400+ cities and villages in 12 countries across the world. A tiny staff supported by interns work tirelessly behind the scenes to support the 70+ Story Scholars who are and have contributed oral histories, and over 550 Citizen Historian volunteers who have devoted an estimated 50,000 hours in volunteer labor towards recording stories. In addition to oral histories, The Archive also digitizes and preserves antiquated and current photographs of significance, family portraits, as well as objects of significance from the time of Partition. Over 30,000 photographs are preserved in this manner. Video: Radhika Kishan Chehnani migrated from Sindh to Mumbai (full interview coming soon).